We have a great new high-value coupon to save $5 OFF any ONE (1) AVEENO Suncare product (excludes Aveeno Baby Continuous Protection Stick). However, before you buy in store, you might want to take a look online, as sometimes it’s a better deal to price match. 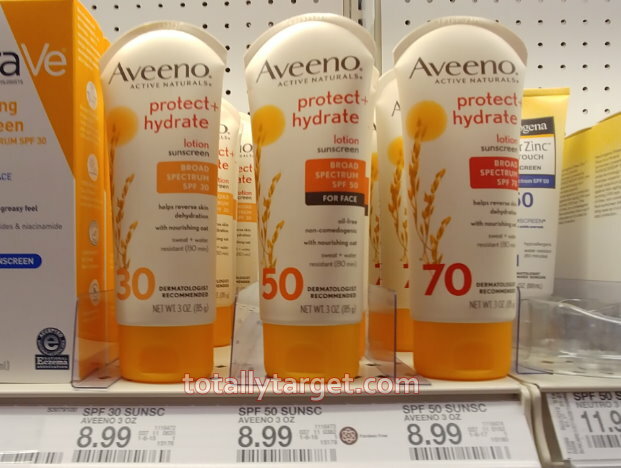 Just for example the Aveeno Protect+Hydrate Sunscreen Lotion is priced at $8.99 in stores, but is only $6.69 online…..
You may notice the Target.com item pictures the new packaging. If you have the older packaging like I do, it will not matter – as long as the DPCIs are identical (which they are) Target should honor the price match.